Daniel Pipes is a historian, commentator and writer who sounded early warnings about the danger of "militant" or "radical" Islam. He is the founder and president of Middle East Forum, a think-tank that branched out into Campus Watch, which critiques Middle East studies; Islamist Watch, which opposes non-violent jihadis; the Legal Project, which protects those who discuss Islamism; and the Washington Project, which provides information to the U.S. administration and Congress. The author of 16 books on Islam, the Middle East and other subjects, Pipes was in Toronto recently for private meetings with supporters. This interview, conducted by Paul Lungen, was edited and condensed for style and clarity. 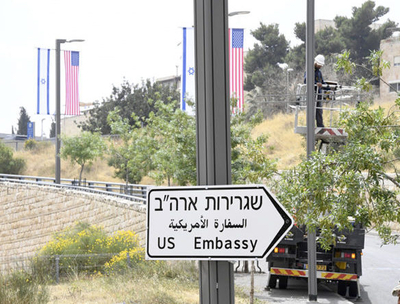 What was the strategic thinking behind the U.S. Embassy move to Jerusalem? There are two different interpretations. The common one is that this is Donald Trump fulfilling his campaign promise. It fits in with a positive understanding of Israel's value, building the U.S.-Israel relationship. I disagree. I see it in the context of a larger effort, little to do with campaign promises and a lot to do with hostility towards Iran. If you wish to build up an anti-Iran alliance, then you need to take several steps. The first is to lavish attention and arms on the Saudis, so that you bring them over as an ally in a way they have never been before. Step two is solidify and warm up relations with Jerusalem – such as moving the embassy. Step three is warm up and solidify relations with the Palestinians. That hasn't happened – quite the reverse. The Palestinian Authority (PA) has engaged for half a year of a boycott of American officialdom. I see this as transitory. At a certain point, either Mahmoud Abbas or his successor will say, "OK, Trump, you've talked to us about some benefit we're going to get. What is it?" And we know pretty well what it is. The U.S. government will recognize Palestine with Jerusalem as its capital and, in return, the Palestinians are supposed to give up the right of return. So, in Trump's thinking, you take care of the Palestinian-Israeli conflict by giving each side what it wants, and then the Saudis will accept Israel as a full-fledged partner and you have a real alliance against Iran. The problem with this is that the Palestinians are not going to fulfill their role, and will not change their hostility towards Israel. This will once again leave the U.S. government annoyed with Israel for not resolving things with the Palestinians. I see Israel being in the hot seat, once again, as the Palestinians misbehave. Preparing for the U.S. Embassy in Jerusalem. What do you see as the way to end the conflict? I call it Israel victory. It will be achieved by the U.S. government in particular, but other governments as well, saying to the Israelis, "Do what you need to do to convince the Palestinians that the gig is up and they have lost." The trouble now is the Palestinians don't think they've lost. They think they have a shot of eliminating the Jewish state and, thus, they give up their children and much else in pursuit of this goal of eliminating Israel. I want the Israelis, supported by their allies, to engage in policies that will convince the Palestinians that there's no hope for this goal. Getting back to the embassy move, it seemed the reaction in Arab capitals was muted compared to what it might have been in previous years? It was extraordinary. Not a single Arab capital, including Damascus and Baghdad, said more than a perfunctory word or two about this. Instead, it was Ankara and Tehran that were exercised about it, and, to some extent, the Europeans as well. The Arab states used the conflict with Israel, for some decades, as a way of mobilizing opinion and distracting opinion away from the current local problems. It's a tiger they want to get off of. What's really interesting is that you see major cracks in Muslim hostility towards Israel, spectacularly in Saudi Arabia. 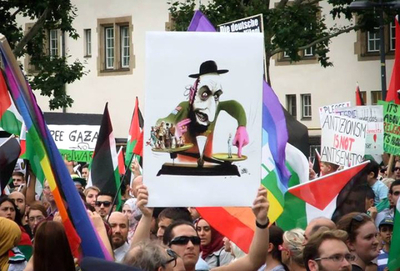 But on the left, the hostility against Israel is growing and growing. Was Israel hurt by the recent Gaza conflict beyond the PR black eye? Did Hamas gain anything from it? Hamas and the PA both know that if Palestinians die, Israel looks bad. It doesn't matter what the circumstances are. I don't know how deep and important that PR black eye is. There's so much else going on in the world that I think this is not the most important development of late. But there is this bizarre transformation where the Palestinian leadership wants Palestinians dead and the Israeli leadership wants them alive. It's not the way war was traditionally conducted. Note the contrasting role of baby carriages for Palestinians (L) and Israelis. Iran sent an armed drone into Israel in February. Israel has bombed Iranian assets in Syria. Where do you see this going from here? Are we looking at a wider war eventually? I'm skeptical that the Iranians are ready for a wider war with Israel; they have enough problems. Their situation in Syria is not yet established. There are major tensions with Russia. Their economy has significant weaknesses. There are internecine problems in the Iranian leadership. As we saw at the turn of the year, the Iranian population is not happy. So I don't think a large-scale war with Israel is in the offing. Also, as the recent incidents show, Israel is far stronger when it comes to conventional warfare. However, the Iranians have other means of making life miserable for the Israelis. They have attacked Israelis and Jewish institutions around the world. Think of Argentina, Bulgaria, Azerbaijan, India. They support Hamas in Gaza but, most importantly, they have something like 150,000 rockets and missiles in southern Lebanon that can be called upon to attack Israel. So the Iranians have major cards up their sleeves – but not in conventional warfare. How have American strategic goals vis-a-vis Iran changed under President Trump? The U.S. government has had problems for 40 years with the Islamic Republic of Iran but, until now, there never has been an effort to change the regime. Under Obama, there was the attempt to bring in the Iranians, to be friendly towards them, to see if that would change them. Before that, it was sticks, not carrots. Under Trump, while it's not a declared regime-change policy, it's awfully close to that. There is an unprecedented willingness to take on the Iranian regime, whether it be economically, through sanctions or in other ways, by fighting them, if need be. So this is a new era in U.S.-Iran relations. If 1979 to 2009 was one era, and under Obama from 2009 to 2016 was a second era, we're now in a third era. Some Arab countries have been moving closer to Israel because of the Iranian threat. Is that a temporary thing that will change to a more traditional hostility to Israel if there's a regime change in Iran? I don't think it will go back to where it was, but it certainly won't continue the way it is now. Yes, this is temporary, this is ephemeral, this is tactical. But in the course of something being tactical for a while, it changes minds. There are now Saudi leaders who travel to Israel. There are plenty of interactions. I don't think it will go back to where it was, but it won't continue to warm up, short of a resolution of the Palestinian issue. It can't go very far. As the demographics change in western European countries, do you expect more hostility to Israel? I don't think it's the demographics that are key. It's not the Muslim population of Europe that has turned Europeans against Israel. It goes to them being leftists and the left is hostile to Israel. [British Labour party leader] Jeremy Corbyn is a symbol of that, but there are so many others as well. But I'm not sure it's going to continue in that direction, because there is a countervailing force that rejects the current establishment. A rally in Stuttart, Germany, on July 25, 2014. These new parties generally have a sympathy towards Israel, and as these parties come to the fore, which one can see all across Europe, with some exceptions, Israel is likely to do better because these parties are worried about Islam, Islamization, Shariah and the like. They naturally look at Israel as an ally in their concerns. I think we're entering a new era in European politics that will be far more unsettled. The old verities are not working anymore. I think there will be more violence, more disputation, more troubles ahead. Things are changing in Europe.